After all the hype and hysteria of the past few days the game is finally here. 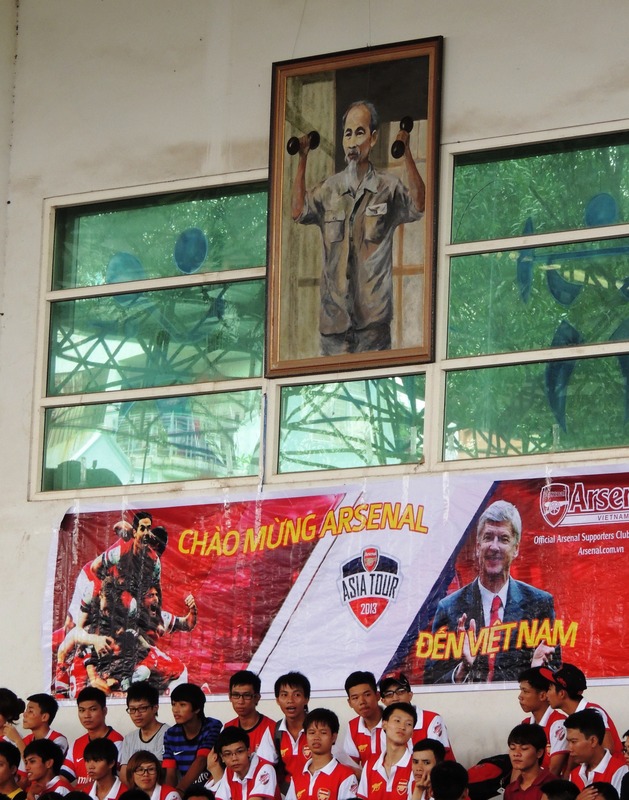 I’ll admit I’ve been pretty excited myself about Arsenal’s visit to Hanoi. Having spent season after season passing through the turnstiles of Highbury, followed by a few seasons at the Emirates, The Arsenal would be here in Hanoi, the city I’ve called home for nearly 3 years. For weeks I’d been worried about getting tickets; at one point when it seemed unlikely I’d resorted to the childlike opinion of “its only another overpriced friendly, didn’t really want to go anyway” . This lasted for about a day and then I was ecstatic to hear the AFCVN (Arsenal Vietnam supporters club) had put tickets aside for foreign gooners. Perfect, 1,000,000 VND lighter (35quid, so yes, another overpriced friendly) and I was once again enthused by the prospect of seeing Wenger strolling around a muggy running track at the My Dinh stadium. The game sold out in a few days, but the huge crowds expected for the general sale at the My Dinh Stadium some ten days ago didn’t materialize. I cycled down knowing my own ticket was secured, just to see if the scenes were reminiscent of queuing along Avenell Road outside Highbury at 4am with my brother trying to secure tickets for the next round of the cup. 7am in Hanoi was slightly warmer than 4am in North London, and there were crowds, not too many as 4000 tickets were later released again. 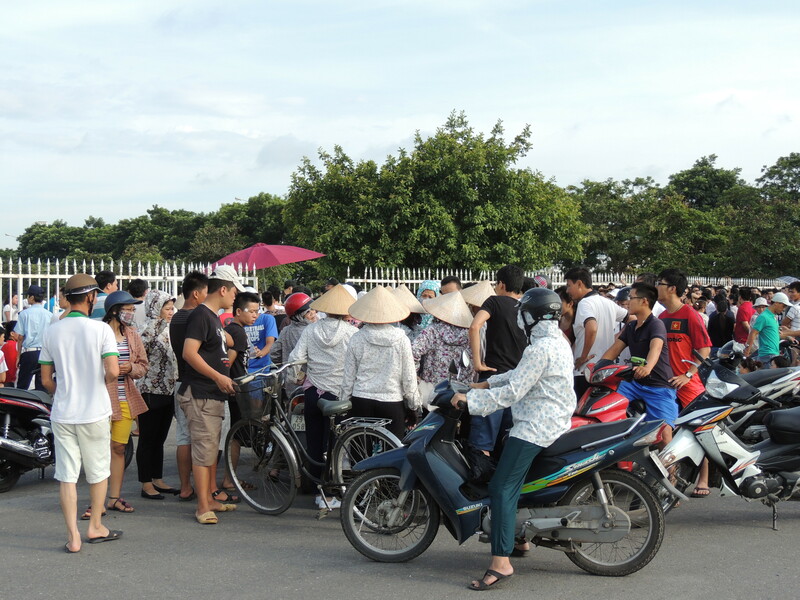 Officially the tickets went on sale at 7am, by 7.20am I recognized a group of ladies in conical hats touting tickets to those that didn’t want to queue; the same women who think shouting and/or hitting me will make me buy tickets from them at the Hanoi T&T games. With prices ranging from 700,000 – 1,500,000 VND (22-50 pounds) many fans have unfortunately been priced out of attending the match. It has been mentioned to me that many fans aren’t happy to watch the National team play and there’s more of a culture to stay at home or visit a café with friends to watch the matches. However, there are a lot of ‘Gooners’ here, with Fan parties being held the past few days and plenty of fun has been had by all attending. 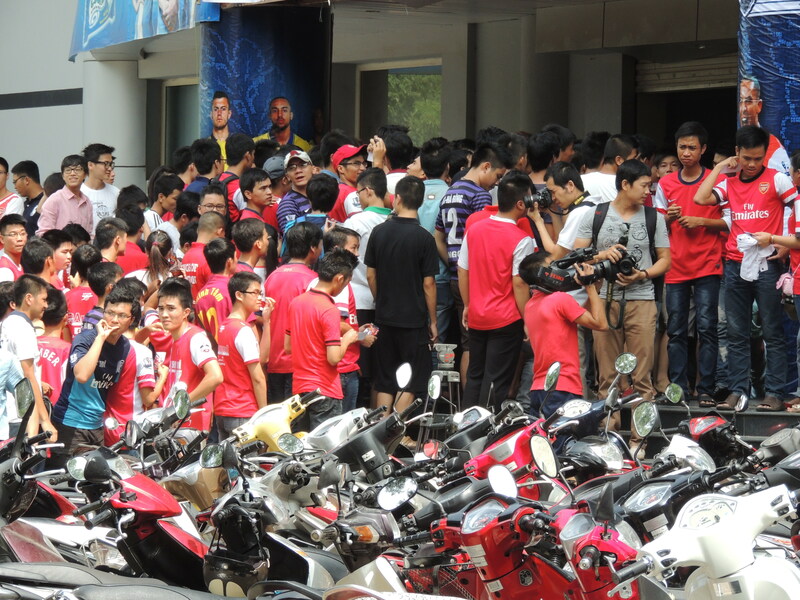 So far I’ve spotted Arsenal Fan groups around town from DaNang, Ho Chi Minh City, Dalat and of course Hanoi. Talking of buses, this must be shared: The Running Man.